If you've been to a track to watch harness racing, you've likely seen the American Standardbred in action. This is how the world knows this solid, dark, strong breed, which has bloodlines reaching back to the 18th century. Its abilities aren't limited to the track, however; their good temperaments and sturdy builds make them a versatile choice for a wide range of applications, from the show ring to the recreational trail. This breed arose in the New England states in the mid-1880s from a melting pot of horses that trotted, paced, and raced both under saddle and in harness. A horse named Messenger is regarded as the foundation of the breed. Many other breeds were introduced to the line, each contributing their desirable racing characteristics. Among these horses were Thoroughbreds, Morgans, Canadian Pacers, and some other now-extinct pacing and trotting breeds. The name Standardbred comes from the qualifying standard time a horse had to cover in one mile to be considered for the registry. The racy body type of the Standardbred is clearly indicative of the task for which it is bred. Some Standardbreds have delicate, almost Thoroughbred-type heads, but more typically, their heads are rather common with longish ears and a flat or slightly Roman-nosed profile. Their legs are long, and the muscles flat and strong. Their chests are deep, and their haunches can appear slightly higher than their withers. They tend to be flatter-sided than most riding horses. The average height of the American Standardbred is about 15HH, although they can range several inches shorter or taller. Some are very tall, while others can be almost pony-sized. They weigh about 1,000 pounds, about the same as the average riding horse. There is no breed conformation standard when it comes to height and weight. 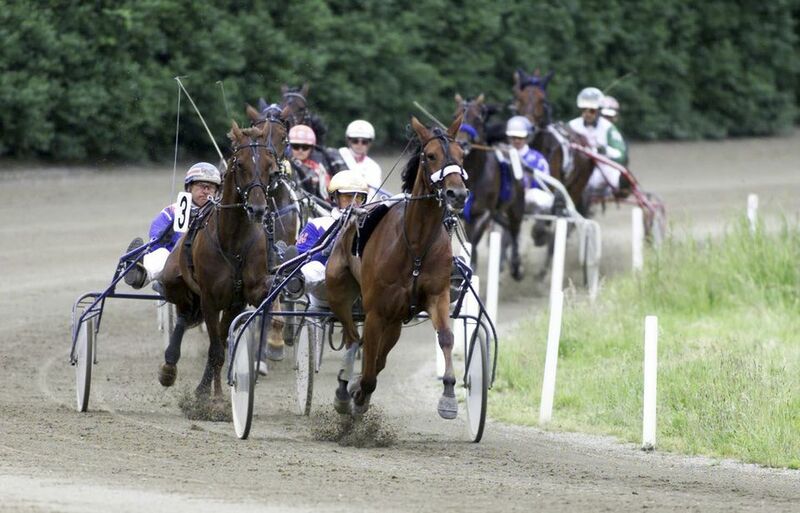 Although primarily bred for harness racing, the American Standardbred can hold its own against any light horse breed in any riding or driving discipline. You'll find Standardbreds in sports such as speed games, distance riding, jumping, competitive carriage, and pleasure driving. Because those trained for the track are so well handled from birth—first trained to drive, then exposed to many other situations—they usually can make the transition to pleasure driving horse easily, without much effort or time. Much of their basic training is done, so they willingly accept riders and learn the nuances of pleasure riding quite quickly. They excel so much in harness racing, however, that these versatile horses are rarely bred solely as pleasure horses. Most Standardbreds are bays, chestnuts and liver chestnuts, grays, and other solid colors. They often lack white markings like stockings and blazes, and they are rarely flashy. There are two distinct types of Standardbreds: trotters and pacers. A pace is when both legs on the same side move together. The speed of pacers in harness is faster than that of trotters, and in North America, pacers tend to outnumber trotters on the track. Pacers often amble, or singlefoot—a smooth running/walking gait that lends itself to a very comfortable ride. The pace can be ridden, too, and some equestrians find it a great way to relax a stiff back at a ground-covering speed. Pacers can be encouraged to trot, making them very flexible horses for show and pleasure alike. Research almost any Standardbred's pedigree, and you'll likely find a horse named Hambletonian (also known as Rysdyk's Hambletonian), an American Trotter that was a foundation sire of the Standardbred. Born in 1849, he was recognizable for his unusual build: only slightly more than 15 HH at the withers but more than 15 HH at the croup. His hind legs propelled him swiftly forward with every step, a race-friendly trait that he passed along to all who came after him. The most prestigious harness race in North American, the Hambletonian Stakes race, bears his name, as does the road where he is buried in Chester, New York: Hambletonian Ave. Likewise, the Chester Academy (also known as Chester Junior/Senior High School) carries Hambletonian as its mascot, and its sports teams are known as the Chester Hambletonians. It's nearly impossible to visit Chester and not encounter an image or reference to the beloved horse. At the turn of the 20th century, harness-racing fans enjoyed the speedy accomplishments of Dan Patch. He shattered world speed records at least 14 times, setting a record for the fastest mile ever run by a harness-racing horse. His record stood unbroken for 30 years. So fast on the track was he that would-be competitors refused to race against him. Without competition, he spent the rest of his working days in performance and exhibition, dazzling fans and earning millions of dollars in product endorsements, purses, and attendance fees. The Harness Racing Museum and Hall of Fame inducted Dan Patch in 1953. Is the American Standardbred Horse Right for You? For a beginner rider, retraining a Standardbred might not be the ideal introduction to horse ownership. More experienced riders, however, might enjoy the rewarding task of retraining a former racehorse to become a riding or pleasure driving horse. While the intelligent Standardbred takes to such direction quite easily, some of the challenges of retraining these horses are teaching them to canter or lope—and for pacers, to trot and not pace while being ridden. It's possible to ride a pacing horse, but most people find it quite different from the usual riding experience. Many riders enjoy the Standardbred's tendency to singlefoot. In general, horse owners are coming to appreciate the Standardbred as a horse suitable for any sport. Some shows exist for owners of retrained Standardbreds to show off their abilities under saddle and in harness, and some shows have classes in which gaited Standardbreds may be shown.